This is the first report of tool-using behaviour in a wild brown bear (Ursus arctos). Whereas the use of tools is comparatively common among primates and has also been documented in several species of birds, fishes and invertebrates, tool-using behaviours have so far been observed in only four species of non-primate mammal. The observation was made and photographed while studying the behaviour of a subadult brown bear in south-eastern Alaska. The animal repeatedly picked up barnacle-encrusted rocks in shallow water, manipulated and re-oriented them in its forepaws, and used them to rub its neck and muzzle. The behaviour probably served to relieve irritated skin or to remove food-remains from the fur. Bears habitually rub against stationary objects and overturn rocks and boulders during foraging and such rubbing behaviour could have been transferred to a freely movable object to classify as tool-use. The bear exhibited considerable motor skills when manipulating the rocks, which clearly shows that these animals possess the advanced motor learning necessary for tool-use. Advanced spatial cognition and motor skills for object manipulation during feeding and tool-use provide a possible explanation for why bears have the largest brains relative to body size of all carnivores. 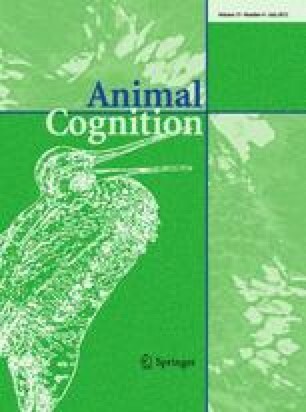 Systematic research into the cognitive abilities of bears, both in captivity and in the wild, is clearly warranted to fully understand their motor-learning skills and physical intelligence related to tool-use and other object manipulation tasks. I thank Genette Foster, Duncan Innes, John Innes, Margaret Moss and Michael Moss for valuable assistance in the field and am indebted to the staff of Glacier Bay National Park and Preserve for their help during our stay in the Park, particularly to Christine Gabriele and Tania Lewis for providing information on the whale carcass, age of the observed bears and moulting behaviour of Alaskan brown bears. Thanks to Susan Healy, Simone Pika and two anonymous reviewers for valuable comments on earlier drafts and to Johnny Rogers for his generous loan of photographic equipment.